All products are designed by Vilt Van Ver (Felt From Far) and fairly produced by hand in Nepal. These roots from our products begin in the country from which its greatest export product is wool: New Zealand. 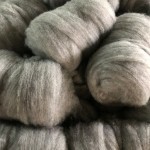 From New Zealand uncarded wool is shipped to Nepal where it is carded dyed at the factory. The dyed wool is rolled up into a tight ball. The ball is placed in a bucket with warm water and soap. 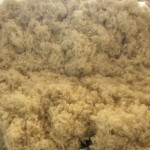 The water and soap causes the wool fiber is felting. The balls are squeezed, rubbed and rolled with a shelf until they have the right size and shape. Since the balls are full with water, they are dried in a centrifuge. In Kathmandu it is cranked by hand every day because they have to deal here with blackouts. At this location in Kathmandu they only have power for two hours a day. After centrifugation, the balls are placed on the roof of the workplace where they can further dry under the Nepalese sun (as long as it is dry!). Once the balls are completely dry, they are strung together to form a coaster or trivet. All in all, an incredibly time-consuming process. A process that consists out of 100% handwork with the result that each coaster and trivet is unique. Vilt Van Ver cooperates with a Nepalese organization which has a Goodweave certification for fair wages and conditions and employs mostly women. This organization therefore creates the opportunity for women to be financially independent. Which is not obvious in Nepal.